Researchers at the Federal Reserve Bank of New York believe these unprecedented student debt levels may be dampening house purchases by first-time buyers. Student loans cause individuals to do poorly under two of the primary tests by Freddie Mac and Fannie Mae that lenders use to approve standard home loans. One test is the credit score. The average score for 30-year-olds with student loans is 24 points lower than their debt-free friends’ scores – that difference used to be three points, the Fed researchers said. Eroding credit scores are a fairly recent development. A second test for getting a mortgage is the borrower’s debt payments relative to his income. Under this test, individuals already making payments on their student loans every month are more likely to be disqualified for a mortgage. Many more young adults, aware they couldn’t make a house payment, probably don’t even apply for a mortgage. One benefit of homeownership is that millions of Americans have, by paying down a mortgage over many years, accumulated savings they can use later in life. With fewer adults today able to buy a house, it could make this country’s retirement outlook that much worse. Not only can’t they pay a mortgage, they can’t contribute to a retirement plan like an IRA or 401(k) which whacks their net worth…and possible retirement income sources…even more. Students at any age are having problems paying off student loans. This trend will continue until the job market becomes more flexible. Employers are having a hard time finding qualified candidates and the young graduates are having to deal with lack of experience. The chicken or the egg theory comes into play when the skills (education) or the experience play a pivotal role. The balance must be met with clenched teeth in dealing with those two factors. The skill sets expire after several years of working in trivial jobs to pay off their debt. Many people in the job market have given up on finding good jobs when life intercedes with family responsibilities is added to the formula. Excellent article. 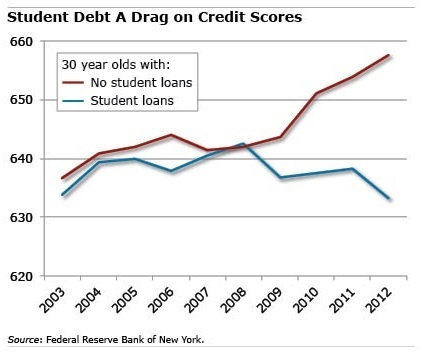 I see quite a few younger adults entering the workforce now living at home again until student debt can be paid down.